Fabmatics handed over the donation to the Sonnenstrahl e. V. on November 29, 2017. For our first birthday celebration on September 21, 2017, we invited our guests to invest in a donation for the Sonnenstrahl e. V. instead of a gift. The Sonnenstrahl e.V. is one of about 100 parents assocciations in Germany which takes care of kids with cancer and their families. We are very pleased that so many customers and suppliers have joined this idea. 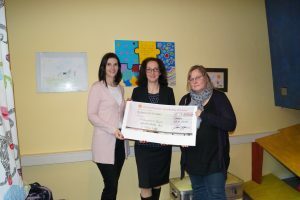 Together with an amount from Fabmatics, we could proudly present a donation about 3,500 Euros!